CLIMATE CHANGE is always on the news headlines nowadays. People from all walks of life, nations from the smallest to the greatest, to the United Nations, are all in concerted effort to solve or mitigate Climate Change destructive effects. And because of its destructive effects, the phrase "Climate Change" was given a negative connotation, concealing behind it the positive and productive effects of Climate Change. Some admitted that there are so many unknown factors in the Climate Change processes. One major example is the recently discovered phenomenon called Global Dimming, which is the opposite of Global Warning. Global Dimming is an unexpected issue of Climate Change. At first, scientists don't even believe that it could exist. Global Dimming reduces the amount of sunlight reaching the surface of our Earth, the cause of which is air pollution, not CO2. How about the possibility that another unknown factor in Climate Change could suddenly appear and proven to exist? Scientists, weather forecasters, religious and ordinary people are confused with Climate Change. The great devastation caused by the recent supertyphoons causing heavy rainfalls and flashfloods, dust storms, wildfires, drought, etc. were unexpected by the modern world. So the world organized so many Climate Change Conferences for the Nations to discuss "solutions" to the worsening Climate Change crises. WHAT CAN WE EXPECT FROM THE MANY CLIMATE CHANGE CONFERENCES? How much are the industrialized countries willing to reduce their emissions of greenhouse gases? How much are major developing countries such as China and India willing to do to limit the growth of their emissions? How is the help needed by developing countries to engage in reducing their emissions and adapting to the impacts of climate change going to be financed? How is that money going to be managed? But Yvo de Boer thinks it will be very difficult to get every final, small detail of a whole new treaty done. The new climate treaties will be replacing the Kyoto Protocol which was adopted in Kyoto, Japan, in December 1997. According to Maanee Lee is Minister of Environment of Korea. "What we are seeing now is the humankind putting itself under a fatal threat by the act of its own. The threat is the kind that the humankind has never experienced before, in scale and in magnitude." CAN MAN REALLY SOLVES THE DESTRUCTIVE CLIMATE CHANGE? So, World leaders, as well as, people from all walks of life, are becoming very concern, and they are thinking and discussing ideas and solutions to Climate Change problems. But their ideas and solutions are all humanistic, and therefore, are destined to failure, and will instead contribute to the worsening of the problems. One big example of this is in solving Global Dimming. Solving Global Dimming, worsens Global Warming! And solving Global Warming worsens Global Dimming! For an in-depth explanation of Global Dimming, go to: GLOBAL DIMMING: A New Kind of Climate Change! The trend of debates and discussions about the solutions to Climate Change is mostly directed to carbon dioxide emission reductions, financing, energy efficiency, sun-based economy, "green revolution", Renewables, etc. These man-made solutions may somehow alleviate the effects of Climate Change, but with these materialistic and humanistic ideas alone, man's solutions are bound to fail. This is because the root-cause and root-solutions to Climate Change disasters are spiritual. They are not political, not technological, not financial, not legal. The main reason why man cannot solve the Destructive Climate Change is because Mankind is trying to solve his many problems by himself, and does not involve the Creator and Controller of Climate Change => Who is the LORD God. If we ask the LORD why there are Climate Change Disasters, His answer is mainly because Mankind rejected God's Counsel of His MESSIANIC KABBALAH WISDOM (Psalms 107:11, Proverbs 1:25-29, Isaiah 24:5). 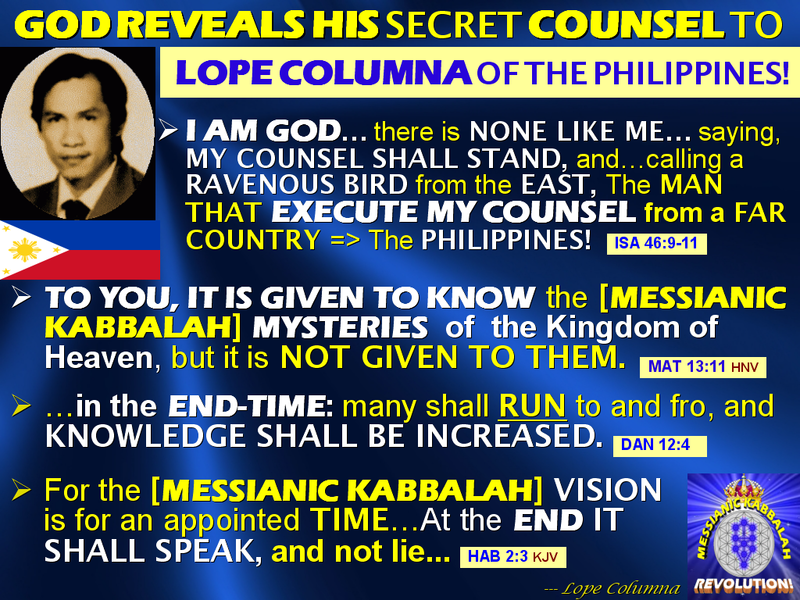 This rejection and lack of God's MESSIANIC KABBALAH COUNSEL, resulted to "WHIRLWINDS" or Super Typhoons and other Climate Change disastrous effects (Proverbs 1:27). THE PROBLEM CANNOT SOLVE ITSELF! Man alone cannot solve Climate Change. The Global Climate Change crisis is way beyond human solutions. How can someone who caused the problem, provide the solution without changing his mindset and attitude? The same kind of humanistic thinking that caused Climate Change in the first place, can never gives the right solutions! Man is the problem, so how can the problem solve itself without changing his thinking and attitude? The Nations of the whole world have met, and are continually having conferences discusiing what they should do to mitigate or solve the serious and worsening Climate Change Disasters. The weakness of these world meetings and conferences is that Nations will just present their own humanistic ideas, without God's involvement and ideas. 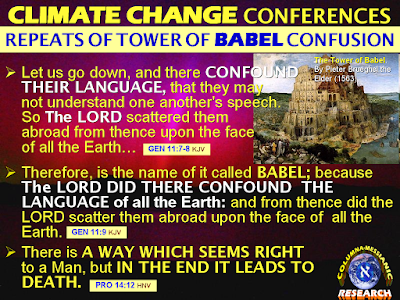 This is similar to the time of the Tower of Babel, wherein the United Nations at the leadership of Nimrod, agreed to solve the problem, or to escape the tragedy of the Global Climate Change of their time that resulted in the worldwide Noah's Flood. The Tower of Babel according to the Book of Genesis, was an enormous tower built at the city of Babylon (Heb. Babel). 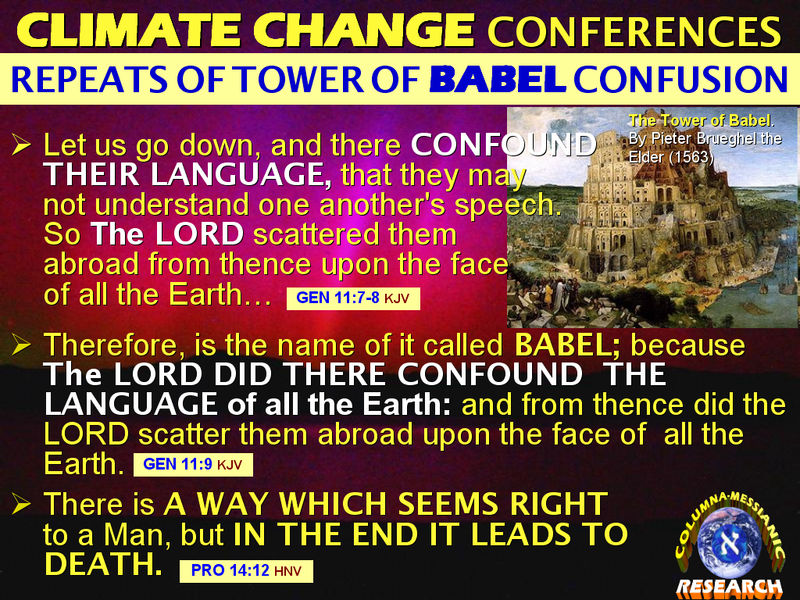 According to the biblical account, a united humanity of the generations following the Great Flood, speaking a single language and migrating from the East, participated in the building of the Tower of Babel. The people decided that their city should have a tower so immense that it would have "its top in the heavens" (Genesis 11:1-9). The Tower of Babel was not built for the worship and praise of God, but was instead dedicated to the glory of man, to "make a name" for the builders. Scientists are stressing that the roots of global dimming caused by pollutants and global warming caused by greenhouse gases have to be dealt with together and soon. A BBC Horizon documentary warned, "We may have to change our way of life. While this has been a message for over 20 years, as part of the climate change concerns, little has actually been done. "Rapidly," the documentary concluded, "we are running out of time." The situation is so alarming that we need to awaken ourselves and take corrective measures as early as possible. The very origin of Global Climate Change started when man believed Satan instead of God. Man's first sin of eating the fruit of the forbidden Tree of the Knowledge of Good and Evil effected the very first Climate Change in the history of mankind. From the beautiful, productive, and comfortable climate inside the Garden of Eden, man was suddenly exposed to the harsh climate outside the Garden! And, in this harsh environment outside the Garden of Eden, Man continues to distance from God, and prefer not to believe God; but, continues to believe the deceived and sinful Mankind => The Scientists, Experts, Politicians, and Religious Leaders. Not trusting God, man uses his own will and fallen mindset to solve his problems; to his own destruction. DUE TO MANKIND'S REJECTION OF GOD'S COUNSEL, IT WAS HIDDEN FOR 2,000 YEARS SINCE THE DEATH OF APOSTLE PAUL! 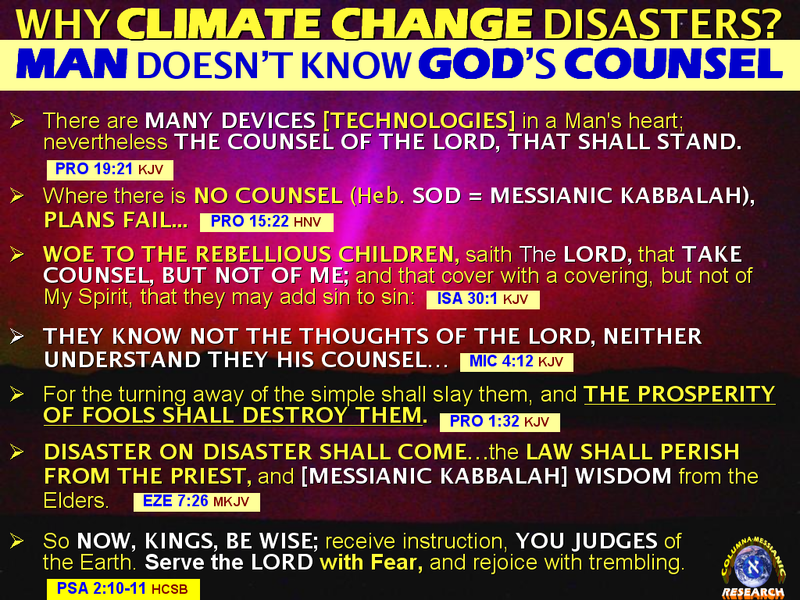 So, we have heard the human side of Climate Change issues, and the root-cause of Climate Change Disasters => The lack or rejection of God's Counsel of Messianic Kabbalah Wisdom. Scientists, Governments, Magazines, and Documentaries are giving proofs to the existence, damages, and future implications of Global CLIMATE CHANGE. They give their fears, findings, and recommendations. They also admitted that humans are the culprits of these Global Environmental issues. So, where do we go from here? Man Must Return to God for Climate Change Solutions! 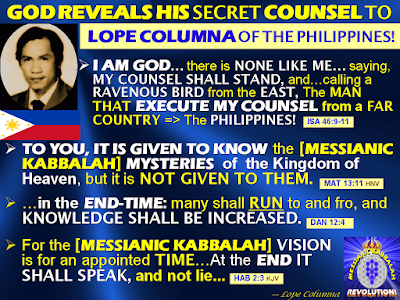 IN OUR 21ST CENTURY END-TIME, GOD ONCE AGAIN MADE PUBLIC HIS COUNSEL OF MESSIANIC KABBALAH VIA HIS CHOSEN FILIPINO "MAN FROM THE FAR EAST." We must learn that to really solve Climate Change, and escape from its disasters, as well as, other grievous crises, we have to come to the Creator and Controller of Climate Change, and ask for His help and divine protection!